Royal/KÖMMERLING becomes part of H.B. Fuller creating global TOP 2 pure play adhesive Company. Chemicals Innovation Limited (CIL) located in Preston, UK, a manufacturer of high-performance adhesives for rubber/metal bonds, becomes part of KOMMERLING UK and strengthens the KÖMMERLING product portfolio in the area of Transport. Royal Adhesives and Sealants become the new owner of ADCO Global. This means that KÖMMERLING becomes a member of the Royal Adhesives and Sealants Group and now belongs to the Top Ten companies worldwide in the adhesives and sealants industry. KÖMMERLING establishes a new production site in Nanjing, China to supply the Asian market in the areas of Insulating Glass, Solar Technology and Transport. Certification of the entire management system in accordance with DIN EN ISO 9001:2000 (Quality Management), DIN EN ISO 14001:2004 (Environmental Management) and OHSAS 18001 (Occupational Health and Safety Management). KÖMMERLING takes over the insulating glass product sector from Chemetall along with the production site in Langelsheim, thereby becoming the global market leader in the area of polysulfide sealants. KÖMMERLING Chemische Fabrik GmbH is acquired by ADCO Global Inc. in Chicago/Illinois. ADCO now has seven sites worldwide – in America, Europe and Asia – with more than 700 employees. As one of the first manufacturers of adhesives and sealant systems, KÖMMERLING gets certified in accordance with the internationally recognised quality management standard DIN ISO 9001. KÖMMERLING starts to market elastic adhesives based on polyurethane (Körapur) and silane-terminated polymers (Körapop). KÖMMERLING is the first company worldwide to present a primer-less polysulfide-based sealant system (GD 116) for insulating glass secondary seals. With the development of the Köratac range, KÖMMERLING creates the European-wide basis for industrial solvent welding. With the establishment of the business area “Technical Adhesives” and the development of the Körapox product family, KÖMMERLING sets a milestone for modern constructive adhesives. KÖMMERLING produces the world’s first contact adhesive on the basis of synthetic rubber. This pioneering development revolutionises shoe manufacturing in Europe. Karl Kömmerling founds the Karl Kömmerling oHG. He supplies the steadily growing footwear industry in Pirmasens with adhesives such as wheat gluten, lasting glue or celluloid adhesive. 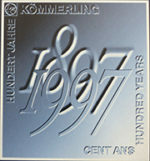 In the following years, KÖMMERLING starts its own development and production of adhesives.